While Astro’s B.yond promises high definition (and to most extent and purposes, deliver on that), it is nowhere near as revolutionary as colour transmission. High definition content is not new. If you are running your PC at resolutions better than 1280 x 720 pixels, it’s already 720p HD. 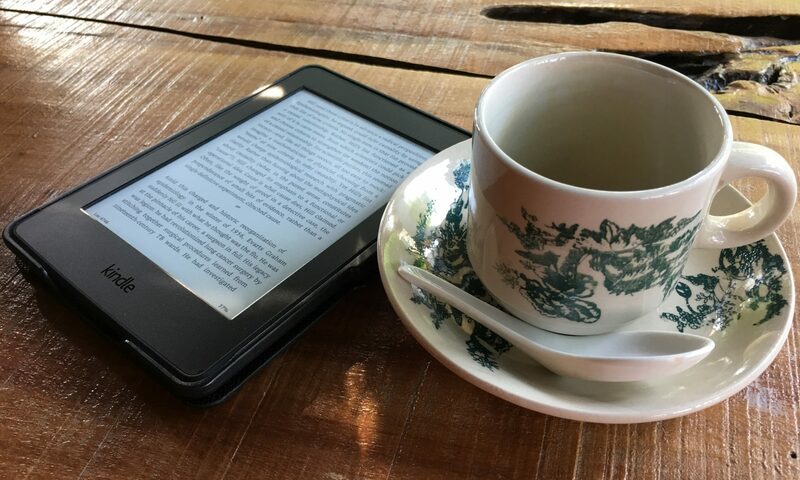 If your puny 2 Megapixel camera takes images at 1600 x 1200 pixels, it already has more height information than 1080p, which is the current highest standard for HD. 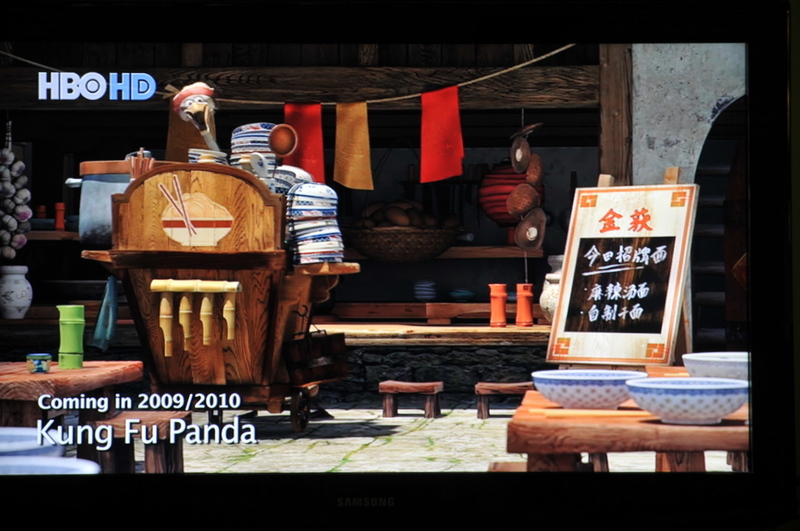 Bluray discs (and earlier HD-DVD), gaming consoles like PS3 and XBOX360 had gone HD since a couple of years ago. Therefore, Astro B.yond, unlike colour television, does not have a high novelty factor. It would be hard to imagine your neighbours curiously crashing into your living room to see for themselves what the HDTV fuss is all about, no matter how more lines you can find on the face of David Letterman. 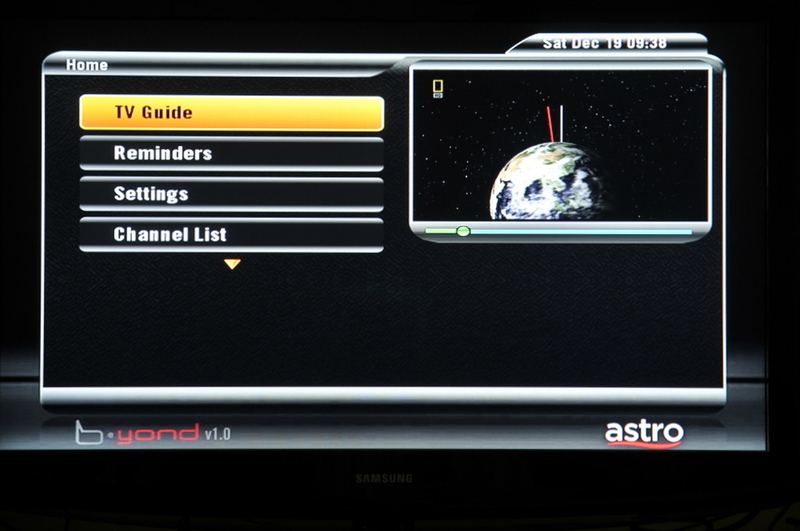 Currently, B.yond only has 4 channels in HD (NatGeo HD, History HD, HBO HD, Astro Supersport HD) with ESPN HD coming soon. 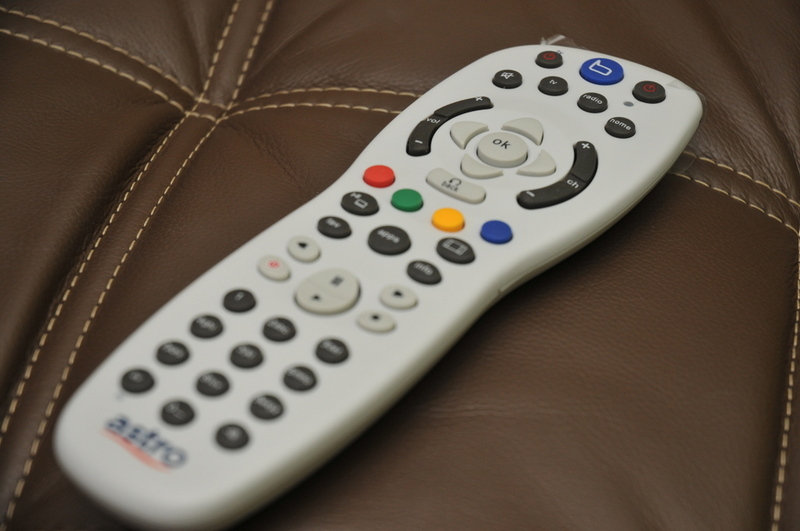 To get these channels, Astro requires you to change the dish, decoder, smart card and remote control. 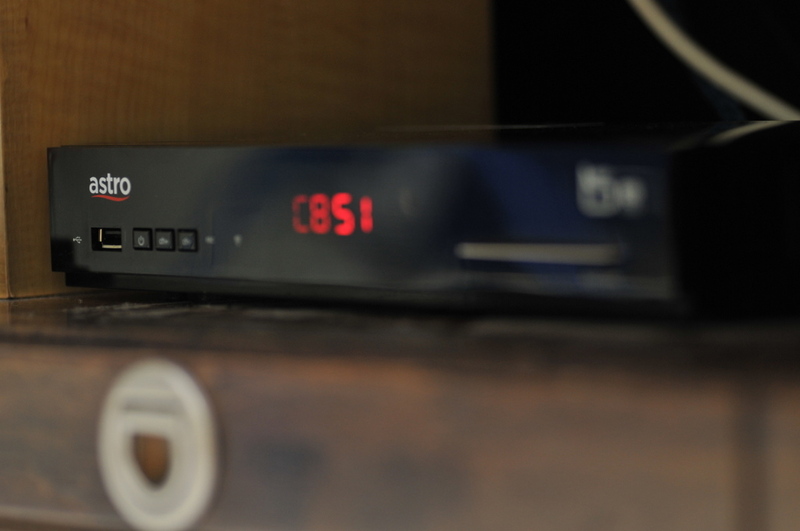 The new Set Top Box (STB) is smaller and slicker with a redesigned on-screen menu system. 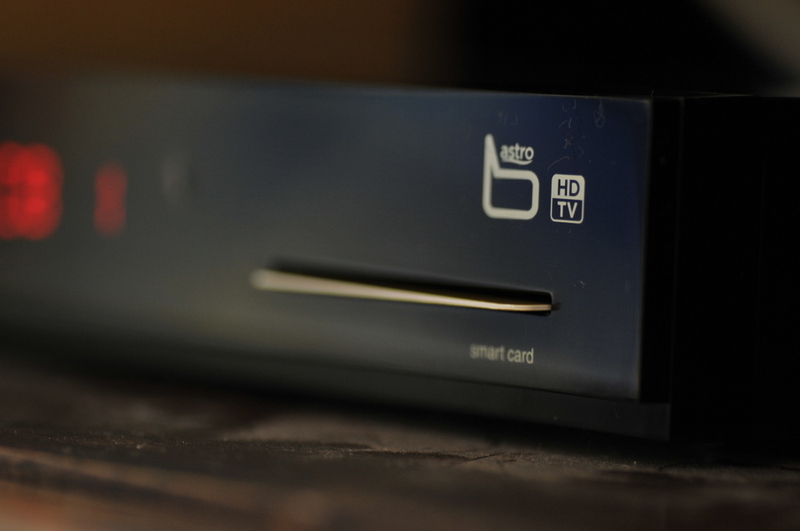 There is an USB port on the front which one may connect memory devices if Astro were to release TiVO like features in the future. 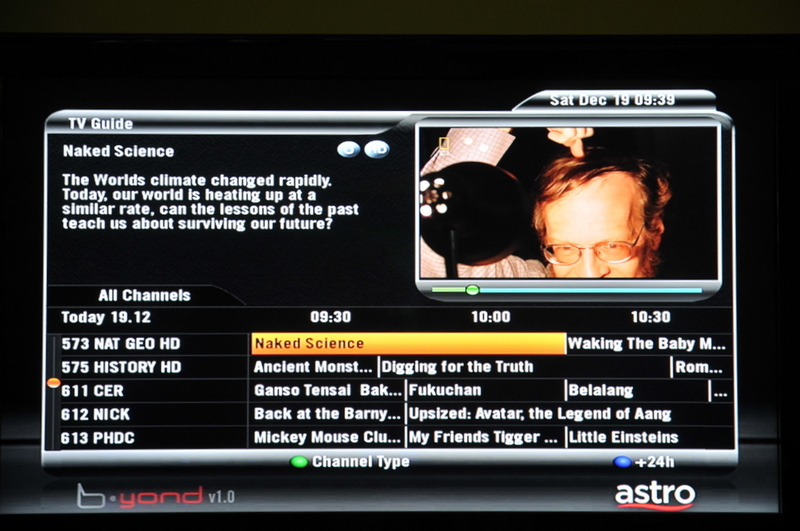 Originally, I had stripped down my Astro subscription to only the bare basics, a form of boycott for the ever increasing bill. What this meant was that I can only watch the documentary channels, so I spent quite a lot of time initially watching Megadisasters, Ice Truckers, Mega Movers, etc. A very little publicized fact is that the programming for the HD channels of NatGeo and History are actually different from the standard definition (SD) channels. The shows may be the same but the scheduling is totally different. However, HBO HD is essentially the same channel as HBO SD except for the 60 minutes delay while Supersports HD is a repackaged Supersports 2 in HD. The documentary channels look absolutely spectacular. The colours are indeed much richer and there are just so much details in those programs (one can easily read the finer prints on the background or count the number of lines the talking head has on his, er, head). Inspired, I signed up for the movie package and I got to watch HBO HD. 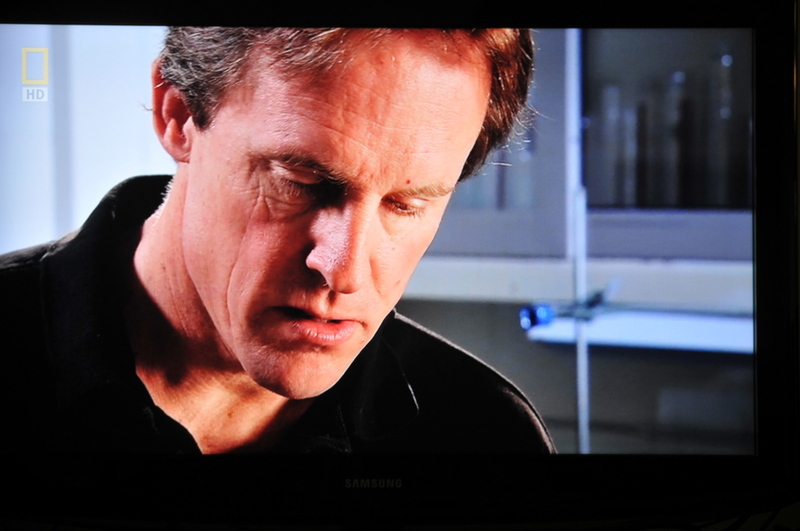 This is when my excitement got a little doused as the quality of HBO HD was not as great as the documentary HD channels. Perhaps it’s the compression profile that Astro uses for this channel but pictures look softer and filled with blocky compression artefacts, especially during action sequences. Some scenes are quite unwatchable and remind me of badly recompressed pirated DVDs. Another big beef that I have is with the sound. 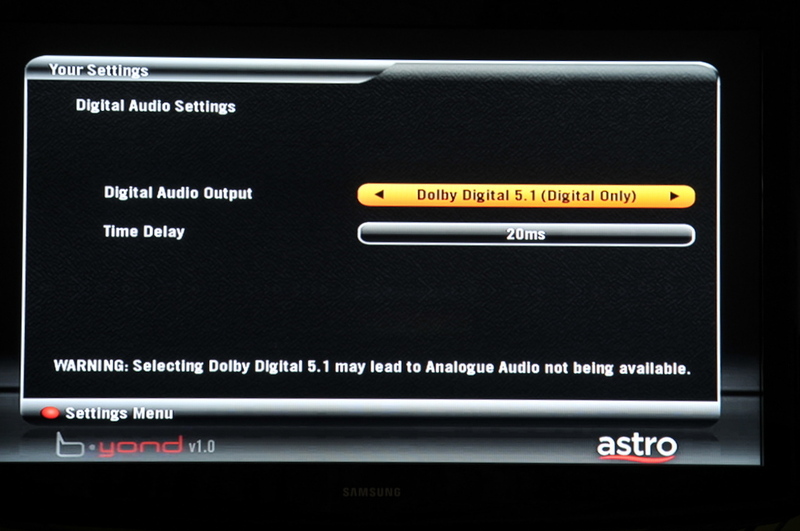 Even though Astro B.yond touts having Dolby Digital sound, the quality is really bad. The audio channels are often encoded wrongly. 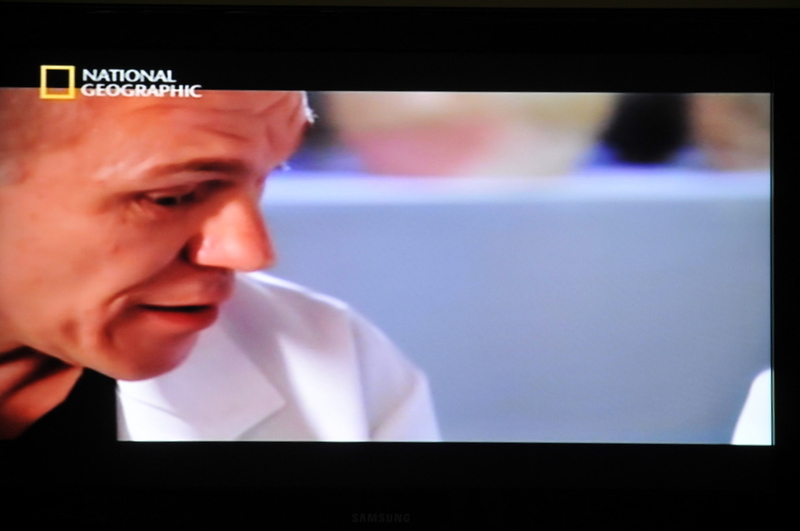 The most common mistake that happens in the NatGeo HD and HBO HD channel is that the vocals are not only coming out from the centre speaker, they are also coming out from the left and right speakers. To make things worse, the same vocal track is not even in synch! This slight delay between the center and other speakers creates a wierd off-phased vocal effect that is just downright irritating. To succeed in this game, Astro would have to bring more care into rolling out this service. With 4 channels today, it is unlikely that they will get conversions from the masses, except maybe during the World Cup 2010 period where all the games will be broadcast in HD. This initial wave of interest today is attracting early adopting HD geeks like me who won’t mind paying RM 20 more per month to enjoy the technology. 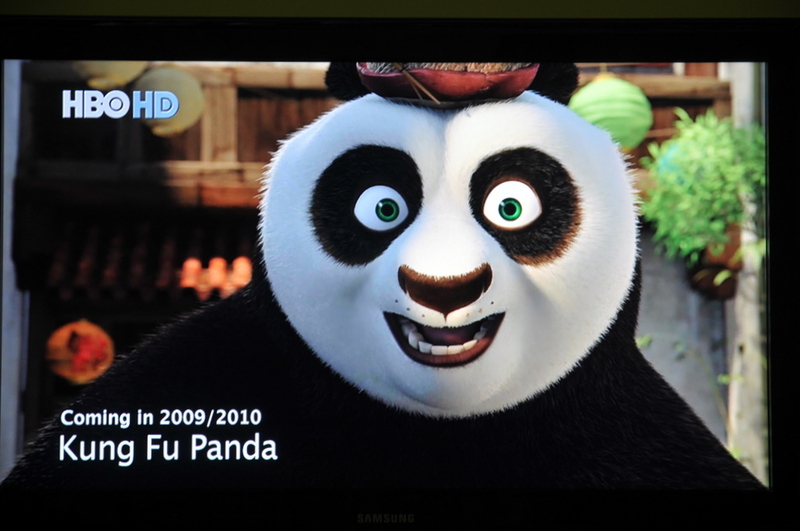 To get the masses, they would have to fix the faults and ramp up on HD content very quickly. That’s because after watching the HD channels, people would wise up and realize that Astro’s standard SD offerings looks really, really bad.